First of all here is one story about water that happened on the 17 hour flight before we go to the top 10 benefits of water a hope you will get some tips from this. At the airport gate, on my way back to the U.S. (from Africa), the second security check confiscated the 3 liters of water I had just purchased in the main terminal. I cried. Literally, I cried. Clearly, the security agent didn’t understand exactly how much water I consume on a 17 hour flight (about 6 liters actually!). Water has always been my drink of choice. It just makes me feel good. I tell my clients to drink water if they have a craving, a headache, are constipated, hungry, etc. Water is so beneficial, so easy, so free yet so easily overlooked. It’s really a no brainer (actually your brain is 90% water!!!). Your body is about 70% water, the majority of your blood and every cell in your body is composed of water. Therefore, you need water to function properly. I don’t get headaches and don’t own Tylenol, Advil, etc. I believe it’s because I drink enough water. I’ve often been complimented on my clear, youthful skin. Again, I thank my water intake! As with most things, the amount of water for each person is very individual, but if your pee isn’t mostly clear or you have any of the symptoms I mentioned above, you most likely aren’t getting enough H2O. Some suggest 8 (8 oz) glasses a day while others suggest take your body weight (in pounds), divide it in half and drink that many ounces. If you don’t care much for the taste of… nothing, then you can add a squirt of lemon, a squeeze of lime, a few sprigs of fresh mint or a cucumber or orange slice. You can even be so bold as to add a few berries or watermelon. What ever gets you to drink it up. Cheers to your good health! As an added bonus, your energy levels are also boosted! A water guzzler is less likely to get sick. And who wouldn’t rather feel healthy the majority of the time? 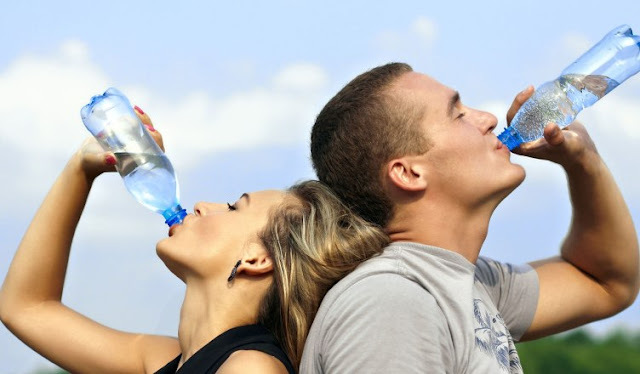 Drinking plenty of water helps fight against flu, cancer and other ailments like heart attacks.